Members of the Blennidae family are tiny. Rather than scales they have a ‘cocoonlike’ mucus to protect themselves. 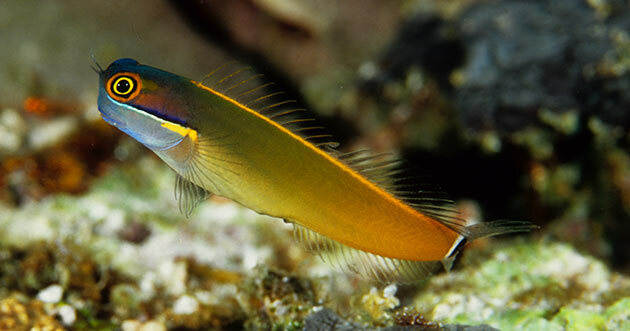 The blenny is a territorial species and prefers to hide in cravices or small holes in reef coral formations. They are either herbivorous or carnivorous. Two groups are important on coral reefs. These are the fangblennies, usually small-mouthed, large-fanned carnivores and the comb-toothed blennies which are herbivores. Like blennies , gobies are tiny fishes. In contrast, they do have scales on their body. It is very widespread and are the largest family of reef fishes with over 200,000 worldwide. Most gobies are ‘cryptic’ bottom-dwelling carnivores of small invertebrates. They live on soft sponges or sof corals. Many species are symbiotic with nearly blind shrimps. The shrimp maintains a burrow while the goby acts as a look-out. In their harmonious relationship, the shrimp maintains contact with its antennae and the goby warns the shrimp with a flick of its tail. The goby is territorial and carnivorous. However, some species are known to eat zooplankton. The midas blenny measures 13 centimeters at the max and is home in environments with rich coral growth at depths up to 30 meters. Their body tint is uni-colour and beautiful yellow or orange or bluish. Its favourite environment is also its feeding area for the zooplankton it catches, often seen teaming up with anthiases and imitating their swimming techniques. The maiden goby grows up to a maximum of 17 centimeters in length. It lives in couples in small indentations, like little holes, that it digs in the bottom of sandy patches at depths up to 30 meters. This goby is whitish in colour, decorated with vertical orange stripes and dotted with orange spots. The Red Sea Mimic Blenny is a species of an algae-eating blenny. Red Sea Mimic blennies use Batesian mimicry. It means that, harmless as they are in essence, can imitate the alarming and warning signals of more dangerous creatures to protect themselves, hence fooling predators. This goby is a small species. It lives in symbiosis, or in association as you wish, with an alpheid shrimp. The Steinitz’ goby is found in parts of the Red Sea at depths up to 30 meters, mainly living on sandy bottoms. The Steinitz’ goby grows to a maximum length of 13 cm. It has bulging eyes and a long narrow white body with five broad, transverse, reddish-brown bands with some fine pale yellow lines between them.